The fundamental question is about the validity of the existing Star Wars Expanded Universe moving forward. 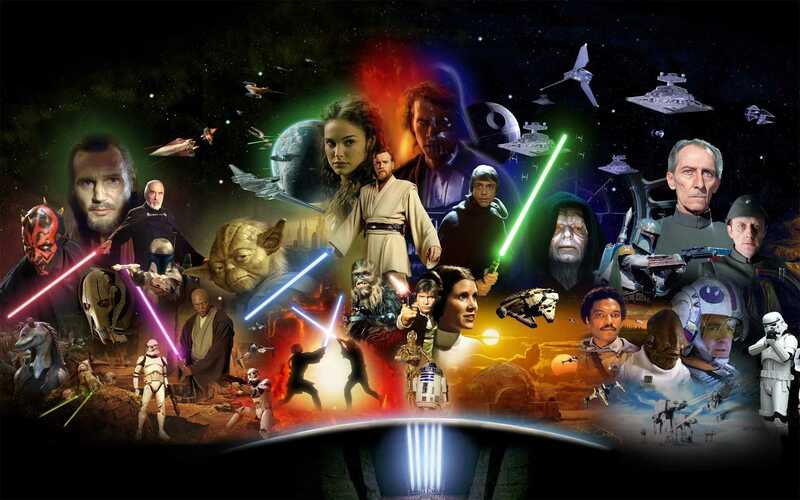 Ever since the first Star Wars novels came out, there has been this huge effort to develop and build on the galaxy far, far away as it was envisioned by George Lucas in its final form for the cinema screens. There have been dozens of novels set in multiple timelines, whether we talk with respect to the timeline of the movies or things far beyond them before and after. There have been several animated series that have done a lot to delve into the time of the Clone Wars. There have been hundreds of comics as well that, like the novels, have really delved deep into the mythologies and lore of the setting. And the same goes for the video games. Over the years, Star Wars has become this huge gargantuan franchise that has spread to pretty much all forms of entertainment media. Consequently, the lore has gotten very detailed, specifically in the times from a few years before Episode I: The Phantom Menace to almost three decades after Episode IV: A New Hope. With talk of the new movie trilogy and various spinoffs under Disney’s overall direction, people are wondering what will happen to this entire lore. Rumours abound that Disney wants to scrap it all, moving forward. Recently, a committee was convened to prepare a single official canon that would be the basis and bedrock of the so-called “new” Star Wars universe. It makes sense why such a committee would be called for. The SWEU is a complex beast and Disney wants to do something to leave its own mark on the setting. Since they are the owners of the franchise, they can pretty much do anything they want, however they want. But there is a lesson to be learned here, before there is an irrevocable misstep made. Under Disney’s direction, Marvel Comics has seen several reboots of its comics lines in recent times. The most notable has been 2012’s Marvel NOW!, which came as a response and reaction to DC’s own reboot, New 52, in the previous year. But unlike its counterpart, Marvel’s relaunch has been incredibly staggered. Just this month, they launched their next reboot, the hilariously-named All-New Marvel NOW! which is seeing the launch of several new titles and reboots of other titles that were already launched under Marvel NOW!. It has created somewhat of a mess, and Disney has to learn from the mistakes made here. Star Wars is not a franchise like the Marvel comics-verse. It is much bigger by far, despite the incredible success of Marvel’s movies in recent times. It spans a successful novel sub-franchise. It spans a successful line of technical books that have been received very well. It spans a successful line of animated series. It spans an incredibly successful line of video games that have spawned their own comics and novels. Such a thing cannot be just rebooted at the whim of studio executives because they feel like it. Comics are a very different medium. They are populated by iconic characters who have a distinct life-cycle. You can’t tell the stories of characters like Superman, Batman, Spider-Man, Iron Man and others without going back to the origins and starting over. These aren’t characters who grow old and die. They remain fixed in the public consciousness because of regular reboots and adaptations in movies and animated formats. The lifeblood of the medium is dependent upon drawing in new readers to replace those who eventually get tired of it all and leave, whether permanently or temporarily. With franchises like Star Wars, things are much, much different. There are entire generations of fans who have experienced these universes with an eye to the continuity of everything. There have been minor (and silly) retcons here and there of a few things, but there hasn’t been anything that has directly contradicted something else in a big way. When they first debuted on cinema screens, Leia and Luke and Han were characters who were still “young”. Over the course of the movies, they grew old. Over the course of the novels and the comics they eventually started their families, they made new friends, new families. They eventually had children who have themselves grown up. They have lost friends along the way, they have lost family members. At the time of Troy Denning’s Crucible, one of the most recent Star Wars novels, the original trifecta/trinity is now pushing well-past middle-age. They have trained entire generations of new heroes. With each new adventure, they have grown. You can look at them, and see a microcosm of the larger galaxy at work. Humans evolved on Coruscant and spread outward from there. Before them, the Rakata and other species held sway over the galaxy. Empires have risen and fallen. The Jedi have come and gone and returned. The Sith have come and gone and returned. There has always been this distinct sense of moving forward, no matter who you talk about, whether an individual or an organisation. To reboot something like that? I think that’s a dangerous mistake. The risk of alienation is far too great. But I won’t deny that moving forward, there are an equal number of problems, such as drawing in new potential fans without saddling them with having to go through more than three decades of lore. Personally, I think that the way that the Star Trek approach has been executed is a good way to go about it. The creators of the new movies didn’t get up to say: “we are going to ignore everything or most of what has come before and we are going to do what we want, how we want”. They’ve kind of done it, yes, but there hasn’t been any move to consolidate the so-called “official canon”. It has been clear that the new movies are in their own continuity, with their own rules of lore. The tie-in comics are the same. I can still enjoy the Greg Cox Eugenics Wars novels which tell of the Rise of Khan Noonien Singh even though the new comics and new movies have given him a new origin that contradicts them to a great effect. Paramount didn’t say that Cox’s novels should be chucked out when Star Trek: Into Darkness debuted on screens last year. And that’s at the heart of it. A full reboot, such as the rumours tell us is more than likely, is entirely the wrong way to go about for Disney and Marvel. One of the reasons that Star Wars has been so prominent in the public consciousness (relatively speaking) is because of the decades of overall continuity that have been built up, whether we talk about the Thrawn Trilogy or Bounty Hunter Wars novels, whether we talk about the X-Wing or Knights of the Old Republic video games, whether we talk about the Dark Empire or the Legacy Era comics, or anything else. The Star Wars Expanded Universe is pretty much one of the greatest space operatic stories ever told, possibly the greatest. That’s not something that you can reboot for the hell of it. I realise that there are a lot of similar things that I’ve been saying up to now. That’s because the validity of the Star Wars Expanded Universe, moving forwards, is one of the greatest topics of debate among the fandom. Most people fall along either of these lines: full and complete reboot of everything; partial reboot with a handful of sources established as canon; no reboots. I find myself struggling to determine where I fall. I would love to see something like Timothy Zahn’s Thrawn Trilogy adapted into the movie format. It is the first ever story in the SWEU unless I’m mistaken, and also one of the best. Something like the rise and fall of Darth Revan, a character first introduced in the Knights of the Old Republic RPG games, would also make for something truly fantastic. It is all still uniquely Star Wars but also something totally different than the original trilogy or the prequel trilogy. I would love to see the rise of Darth Bane and how the Rule of Two came into being. I would love to see the story of Ania Solo from the Legacy Era. I would love to see the meeting of Mara Jade and Luke Skywalker. There is a wealth of material here and it doesn’t quite make sense to me to ignore all of that. I fully acknowledge that Star Wars has a gargantuan mythos and lore, and I happen to love all of it, the good and the bad both, like I said right at the top. The setting has a very unique charm and I would hate to lose all of it. To a layman like me, someone who is interested in seeing something I’ve loved for more than a decade being brought to the big screen, the best course that the new movies and new comics can follow is to forge a path that goes between the two extremes. Go the Star Trek route. Firmly establish that the only official canon are the six movies. That’s it. You don’t need to do anything else. And by official canon I mean that the six movies are going to be the foundational building blocks of the new continuity that Disney will establish moving forwards. Everything that has already come before is just as valid, but they will only be used to tell new stories, not retell those that already exist. There are a lot of things in the SWEU that really could use quite a few tweaks, too innumerable to list here even in brief because of the scope. Take the broad strokes, such as the fact that Luke falls in love with Mara Jade and has a son with her, that Han and Leia raise three kids down the line, that the characters introduced over the years, and the crises as well are all still there. Just that their new adaptations won’t be quite the same. And the thing is, given how huge the galaxy is, there is full room for new stories to include new characters that have nothing to do with the old generation of characters that we’ve known all this time. Example: take the Rebellion Era post-Ep VI and tell the story of a group of Rebels in some other system who are fighting against an Imperial fleet unit in the vicinity to free a world/system. Or something like that. Use the tools that exist to do things. Don’t just hopelessly reinvent the wheel. Posted on January 19, 2014, in Editorial, Movies News, News and tagged Aliens, Animated Shows, Comics, Disney, Editorial, Han Solo, Leia Organa Solo, Luke Skywalker, Marvel, Movies, Movies News, News, Novels, Reboots, Retcons, Science Fiction, Space Opera, Star Wars, Star Wars Expanded Universe, Star Wars Lore, Star Wars Mythology. Bookmark the permalink. 1 Comment.